A few weeks ago I ate lunch at Penguin, in Charlotte, NC, and ordered their veggie burger. Wow, I thought, naively, this doesn’t taste much like the other veggie burgers I’ve been eating. It’s so rich and savory and— Something didn’t seem quite right. I asked our server about it. “Let’s see,” she said, “I know it’s a mix of chickpeas and black beans. . .” “Yes,” I said. “Go on.” “And maybe there’s some chili powder in there?” I stared at her skeptically. “And?” “And maybe he puts some cheese in with mixture? But don’t take my word for it.” All this didn’t seem to add up. On my way to the bathroom I peeked into the kitchen and instantly discovered the missing link: a bubbling vat of oil. The veggie burger was deep-fried. Of course. Now I don’t have any real issues with deep-frying. When done correctly, deep-fried foods don’t necessarily turn into a heavy mass of congealed starch. Deborah Madison even anectdotally mentions (in Vegetarian Cooking for Everyone) that if done right, deep-fried foods don’t absorb any more fat than pan-fried dishes. But in life one must be stingy with indulgences. I decided against deep-frying this one, opting instead to be liberal with the cheese and to pan-fry it in a more [cough] modest amount of oil. They aren’t called Pub Grub for nothin’. Combine the onion, eggs, beans, salt, and chili powder in a food processor and pulse until combined. Turn the bean mixture into a mixing bowl and fold in the parsley, panko, and cheese. Shape into 8 patties. To cook, heat 1/2-inch oil in a deep skillet or frying pan over medium-high heat. Cook the burgers, in batches to avoid crowding, until uniformly browned on each side, 4 to 6 minutes per side. Transfer to a paper-towel lined plate or a flattened paper bag to drain of excess oil. Sounds fabulous. Will have to try thr recipe and get back to you. In Maine at the moment !!! I just tried a bite from Ilsa, who made these last night and let me tell you, as a big meat eater who has always been skeptical of veggie burgers, and never ever tried one before, I have to admit, THIS WAS TASTIER THAN BEEF! And better for me! I just gave up beef for Lent so this could not have happened at a better time. Plus, to make this recipe even more appealing, I have most of these ingredients at home! 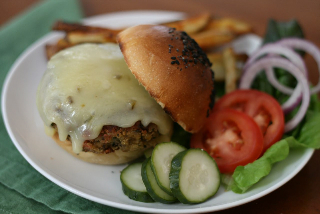 I’ll be making these pub grub veggie burgers this weekend and thinking of you! Delicious, bravo!!! Thanks, Mariel! May I quote you please? What, please, are “panko crumbs”? And the trick with deep frying is to get the oil super hot – that way whatever your cooking doesn’t get a chance to absorb the oil. Panko crumbs are Japanese bread crumbs. They’re larger in size, flakier, and significantly lighter than standard bread crumbs. They’re usually pretty easy to find at supermaket chains, but if that fails, your local Chinatown won’t. Panko crumbs are Japanese bread crumbs. They’re larger in size, flakier, and significantly lighter than standard bread crumbs. They’re usually pretty easy to find at supermarket chains, but if that fails, your local Chinatown won’t. Give this burger a try – not only is it easy to make but it is delicious!! If I don’t have parsely around the house, what else can I add in place of this? I was thinking of adding some additional spices like Italian seasoning. I have just purchased your book and can’t wait to try some of your other burgers! Thanks, Harvey. You could skip the parsley, or a bit of Italian seasoning would probably work. Chives or cilantro would be good also. I like adding some fresh herbs for the green and a slight fresh tickle in the finished burger. The only thing is, the inside stays a little mushy no matter how long I cook them or how much panko I add. Is that just the way it is, or is there a way to fix that? These are quite possibly the greatest things I’ve ever eaten. That’s so strange–I haven’t had that problem with this burger before. I’m trying to troubleshoot…. Usually I’d tell you to add a tablespoon or so more of the panko, but obviously you’ve tried that already. And if you’re using canned beans, are they completely drained? Is your oven at the right temp? It might be that they’re just a little mushy inside! I’m sorry! These were so good! Much better than other veggie burgers I have tried especially those store bought ones. So glad we bought this cookbook. I didn’t have panko crumbs so I used a mixture of matzo meal and plain breadcrumbs. Can’t wait to try them with pepper jack cheese! Thanks for the great recipe. I’m so glad to hear—thanks!